This post was submitted by Keri Halliday from the Kitchener Gospel Hall, Kitchener, Ontario, CA. 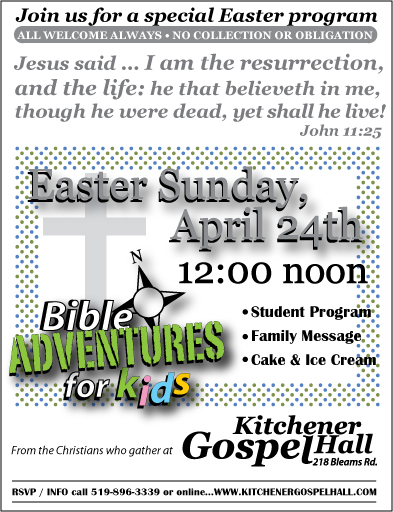 We've had ideas in the past, but the bunnies and chocolate and church traditions sometimes overshadow the ideas we have! Last year was the first year we did anything as an assembly for Easter. Looking to reach out to our Sunday School families and the community, we've hosted meals in the past at noontime and suppertime. 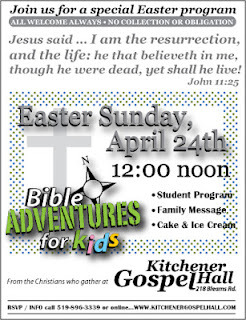 These were well attended but when we thought of doing something similar on Easter, we worried we’d be short on help because of the Easter Bible Conference in Toronto. The truth is, we are not very far from Toronto, and we can be back at our own meeting for the Sunday! We started small: we bought two cakes at Costco and ice cream. One cake said “I am the Resurrection and the Life...” and the other: Happy Easter! This made it easy for the families in the assembly who were busy the rest of the weekend, and yet, it was still a ‘celebration’. The kids had fun, the parents got to see their kids' work (and take it home). We had a special speaker (open Sunday School message), cake and ice cream, and Easter lilies with a ribbon and a little tag on it as a greeting. Simple, but hopefully different from the churches around, with meaningless traditions and their Easter Bunny and chocolates! We're looking forward to another Easter event this year. We hope to advertise using our sign for the community; we will also post invitations in and outside the Hall and maybe have them delivered to the nearby homes as well. Invitations will be sent home with the SS kids and will be advertised for free on kijiji and our assembly website. It would be interesting to know if other assemblies have found that doing the program the week before Easter gives a better result in terms of numbers, or on the actual calendar date for Easter. I guess our focus is the Sunday School. We are so blessed to have the children come along week after week and their fragile families are open to the gospel that we send home with their kids! We get more kids when there are 'events', so we cater to that - it doesn't always have to be a meal. We open it up to 'Families' - in the community too, as well as other contacts. We feel that a Sunday School message is in essence a gospel message and therefore relevant and powerful for all ages. Sometimes the timing is better for families, too, at noon time as opposed to the evening, though we have been switching it up as well. PS. Kite Instructions: Here is the kite: (print on 8.5 x 11 or bigger, fold along the dotted lines after it's coloured, tape down centre leaving a 'fin' at the back, where you punch a hole and tie a ribbon. Add a clear or white coffee stir stick perpendicular on the top across the design and secure with clear tape.) I got the pattern online and added our own images to colour.